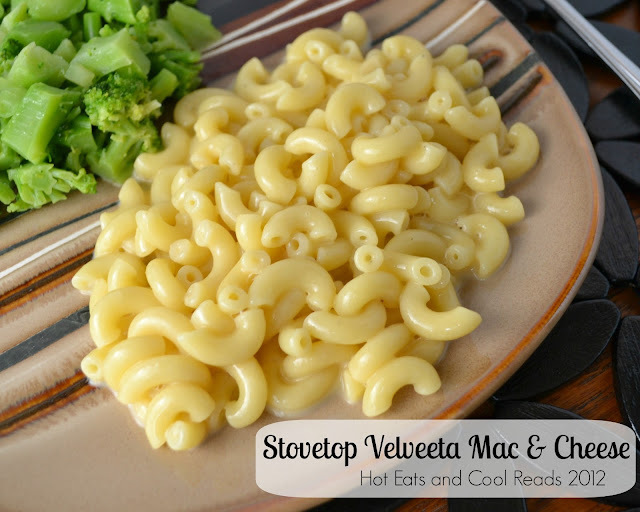 This recipe may be quick and easy, but it's pure comfort food! Ready in less than 20 minutes! This recipe is another childhood favorite of mine. Boxed macaroni and cheese was something we never had in the pantry at our house. Instead, my Mom always made what we called "cheese spaghetti". I don't make this often, but when I do, it brings me right back to my childhood. I still love it as much now as I did then! It's just as quick as the stuff in the box and the flavor is so much better! Enjoy! Cook noodles according to package directions. Meanwhile, start melting Velveeta in the milk over medium heat, stirring often. Add cooked noodles, salt and pepper and continue cooking until heated through and cheese is completely melted. Remove from heat and serve. Sauce will be thin, but it thickens up fast once it starts cooling down. I love velveeta mac and cheese! Have you ever tried to put your own spin on it - adding in meats or veggies? Me too!! We love adding broccoli, peas or ham! The only thing to serve Velveeta mac and cheese with is hot dogs, sliced lengthwise and smothered with ketchup...and french cut green beans. Thanks so much for hosting! I hope you have a great week as well and I hope the hubby likes it! wondering why did this company stop selling the easy melt cheese in the bag. I miss it so. I had it down so well to make my scalloped potatoes and baked mac. the block cheese I find a sticky mess. thank you.